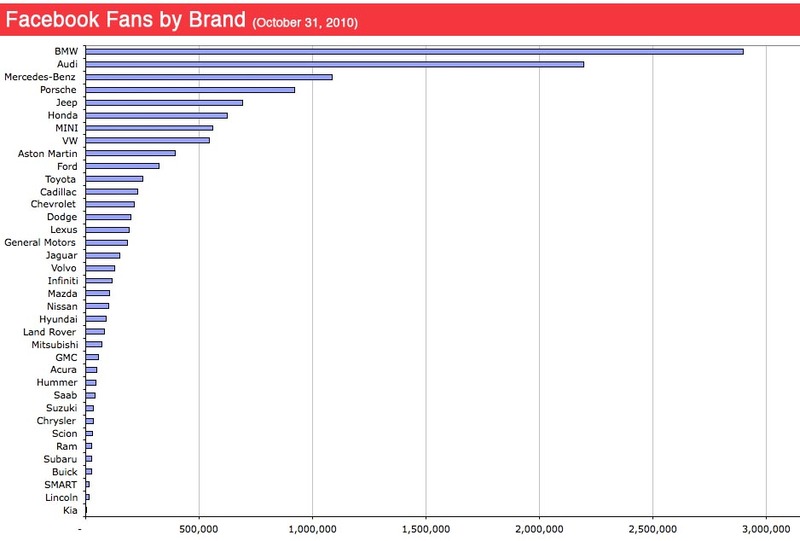 BMW continues to rack up Facebook fans quickly. 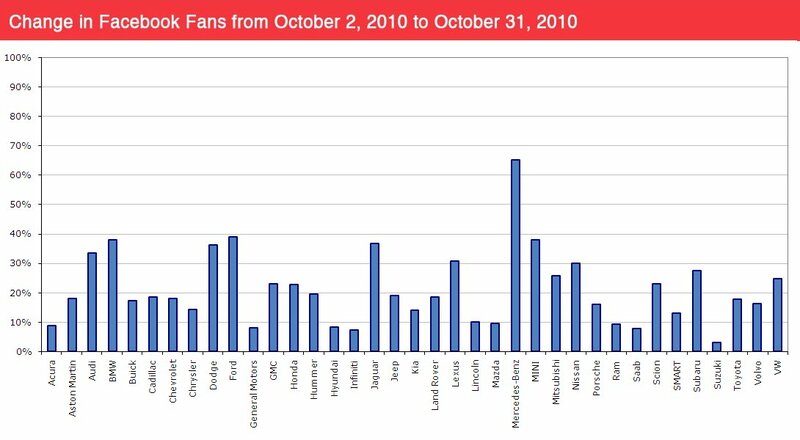 They were near 3 million fans at the end of October and a now over 3 million as of early November. What’s interesting isn’t BMW’s continued rapid growth nor is it Audi following close behind; instead, what’s interesting is another German luxury marquee has decided to play the Facebook fan game. 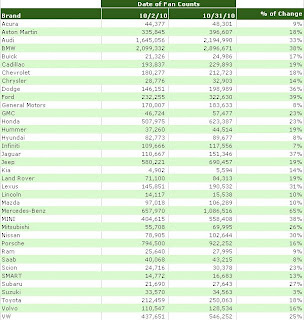 Mercedes-Benz grew an astounding 65% in October and surpassed their own first million-fan milestone. This month Lexus and Toyota both redid their profile images to include additional messaging. Lexus is cross-promoting their Twitter and YouTube accounts while Toyota takes a page from Dunkin Donuts, but with their own twist by featuring a fan’s vehicle. Toyota is also promoting a new shopping application for mobile phones called mLot. Some brands kept up their brand page marketing as Cadillac continued to run reachblock ad units featuring their new Cadillac CTS Coupe that drove fans to the main Cadillac fan page. Volkswagen also promoted their brand fan page. 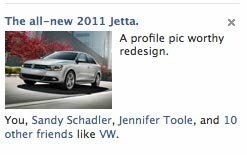 The VW ad units featured the new Jetta that launched last month. What was interesting is that VW used to promote vehicles and bring people to their vehicle fan pages, not the main VW fan page. Seems they are making a change and focusing on the main fan page, not surprising as most of the action is on brand pages not vehicle pages. 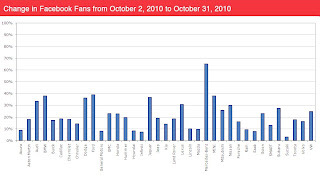 Also interesting is quite a high number of fan pages seeing 20% plus growth in one month. 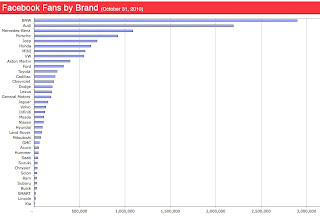 Several of the brands didn’t seem to have ad units running in October yet they experienced some rapid growth typical of buying media. Thanks for the catch. I've corrected it. "Most of the action is on brand pages not vehicle pages" - interesting point. One very important aspect of any good marketing campaign is identifying your target audience and then speaking to them. It's helpful to know, for instance, that your audience has more interest in hearing from a brand than a selection of individual pages (which makes intuitive sense). Knowing that, a successful company can drive up visibility by focusing efforts most on the brand image, as opposed to sub-pages with different vehicle categories. Also great to see some of the top scorers using a variety of social media sites; broader networking is key, and some of the best campaigns incorporate a wide range of strategies and social online profiles.